New England just got hit with our first winter snowstorm of the season—which is late for us—and it was stunning. I love when it snows here! It’s so cozy sitting by the fire while snowflakes fall from the sky dressing our little beach town in white. However, by the end of February I start to feel, eh, over it. It starts to feel a little depressing with cold, gray days and little sunlight. Our mood can get a little dismal. 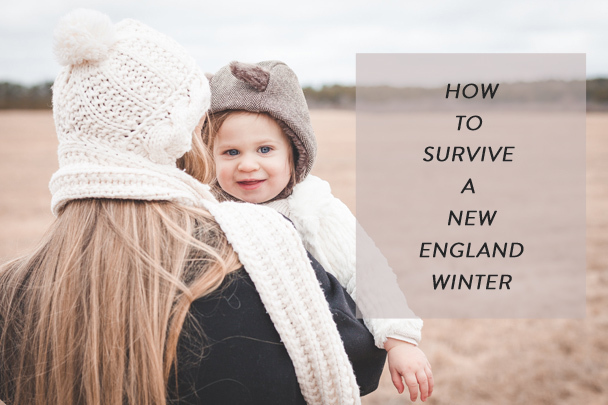 However, there are 7 simple ways to get through this New England weather, check them out below! 1. Lots of Hot Coffee and Tea: A cup of hot coffee on a warm day just doesn’t sound right, so it’s a good thing we have some snow to pair it with. Can you see it now? A nice hot mug and warm slippers in the morning is just the remedy for the winter blues. 2. A Chance to Catch up on the Best Seller List: In the summer I get through maybe three novels on the beach. I am just too distracted, and my bedside table fills up with books I never get the chance to read. In the winter, I have way more inside time to catch up on lots of New York Times best sellers by the fireplace. 4. Cozy Sweaters and Cute Boots: They are essential to surviving the cold weather. But, we are pretty lucky because most states outside the Northeast don’t get to break in those cute LL Bean boots! Winter clothes are so fun—layers for days! 6.Vitamin D: If you live here in the Northeast, you are getting such a small amount of Vitamin D during the winter months. We get this important vitamin from the sun, and when it’s not shining, we can start to feel sluggish and even depressed (i.e. seasonal depression). Make sure you have the proper amount for where you live in your multi-vitamin, and ask your doctor if you are a candidate for an additional dose. 7. Head to the Mountains: Snow, ski, hot chocolate, apres ski and then repeat. Take a weekend to head to the mountains, breathe in that fresh mountain air and get your body moving. Skiing is a great way to burn calories, get out side and even be social! If you live in New England, please treat yourself at least once this winter to a fun ski weekend. Have any more suggestions on getting through this winter? Please comment below or head over to Instagram to get in on the conversation! Photo by the talented Lisa Elizabeth Images.